This article describes how to use the Azure portal to manage automatic user account provisioning and de-provisioning for applications that support it. To learn more about automatic user account provisioning and how it works, see Automate User Provisioning and Deprovisioning to SaaS Applications with Azure Active Directory. Select Enterprise applications from the left pane. A list of all configured apps is shown, including apps that were added from the gallery. Select any app to load its resource pane, where you can view reports and manage app settings. Select Provisioning to manage user account provisioning settings for the selected app. Manual - This option is shown if Azure AD doesn't support automatic provisioning of user accounts to this application. In this case, user account records stored in the application must be managed using an external process, based on the user management and provisioning capabilities provided by that application (which can include SAML Just-In-Time provisioning). Select the Automatic option to specify settings for admin credentials, mappings, starting and stopping, and synchronization. 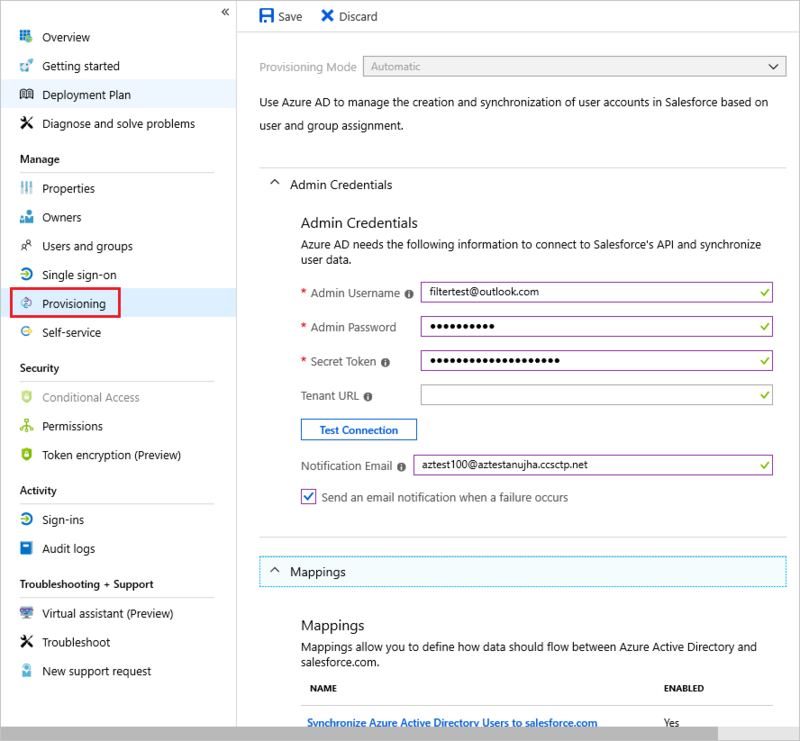 Expand Admin Credentials to enter the credentials required for Azure AD to connect to the application's user management API. The input required varies depending on the application. To learn about the credential types and requirements for specific applications, see the configuration tutorial for that specific application. Select Test Connection to test the credentials by having Azure AD attempt to connect to the app's provisioning app using the supplied credentials. 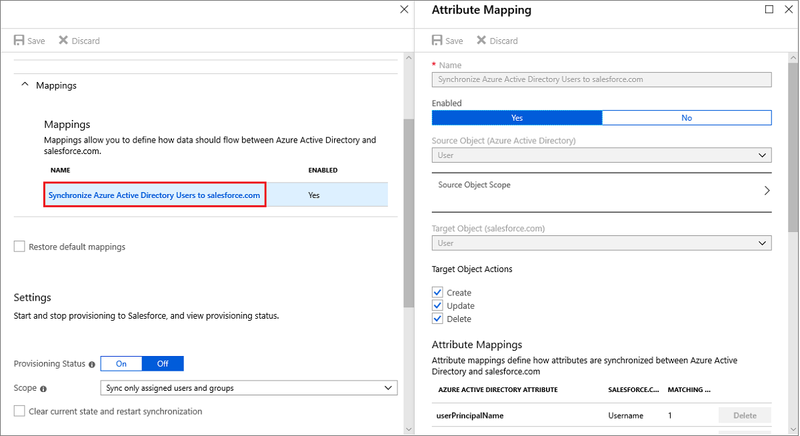 Expand Mappings to view and edit the user attributes that flow between Azure AD and the target application when user accounts are provisioned or updated. There's a preconfigured set of mappings between Azure AD user objects and each SaaS app’s user objects. Some apps manage other types of objects, such as Groups or Contacts. Select a mapping in the table to open the mapping editor to the right, where you can view and customize them. Enabling and disabling mappings for specific objects, such as the Azure AD user object to the SaaS app's user object. Editing the attributes that flow from the Azure AD user object to the app's user object. For more information on attribute mapping, see Understanding attribute mapping types. Filtering the provisioning actions that Azure AD runs on the targeted application. Instead of having Azure AD fully synchronize objects, you can limit the actions run. For example, only select Update and Azure AD only updates existing user accounts in an application but doesn't create new ones. Only select Create and Azure only creates new user accounts but doesn't update existing ones. This feature lets admins create different mappings for account creation and update workflows. Adding a new attribute mapping. Select Add New Mapping at the bottom of the Attribute Mapping pane. Fill out the Edit Attribute form and select Ok to add the new mapping to the list. You can start and stop the Azure AD provisioning service for the selected application in the Settings area of the Provisioning screen. You can also choose to clear the provisioning cache and restart the service. If provisioning is being enabled for the first time for an application, turn on the service by changing the Provisioning Status to On. This change causes the Azure AD provisioning service to run an initial sync. It reads the users assigned in the Users and groups section, queries the target application for them, and then runs the provisioning actions defined in the Azure AD Mappings section. During this process, the provisioning service stores cached data about what user accounts it's managing, so non-managed accounts inside the target applications that were never in scope for assignment aren't affected by de-provisioning operations. After the initial sync, the provisioning service automatically synchronizes user and group objects on a ten-minute interval. Change the Provisioning Status to Off to pause the provisioning service. In this state, Azure doesn't create, update, or remove any user or group objects in the app. Change the state back to On and the service picks up where it left off. This option lets admins start the provisioning deployment process over again. This section provides additional details about the operation of the provisioning service, including the first and last times the provisioning service ran against the application, and how many user and group objects it manages. A link is provided to the Provisioning activity report, which provides a log of all users and groups created, updated, and removed between Azure AD and the target application. A link is also provided to the Provisioning error report, which provides more detailed error messages for user and group objects that failed to be read, created, updated, or removed.